Belle has had some success in her show career so far. At Belle's debutant show she achieved third in her Open and three firsts and a second in her side classes. Congratulations to Belle on achieving first in her Open and two seconds in her side classes. Belle came first in her Open and Best of Breed. She gained two firsts and a second in her side classes. 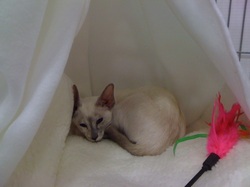 Congratulations to Belle in coming first in her Open class and receiving her first CC. Here's what the judges have had to say about Belle so far. Many thanks to the judges who have judged Belle so far and kindly allowed me to use their critiques. Just adult and well worthy of the certificate . Very good length of head with level bite and a firm chin. Large and well flared ears. 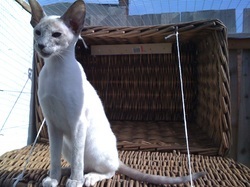 Very good eye shape, Siamese expression and setting.Very good profile but with a minimal muzzle pinch. Long, adolescent and feminine body with very good length to tapering , fine tail. Very good length to limbs and having a long and slender neck. Clear, glacial white coat which is sleek and close lying. Well mingled points showing pale blue and cream shades. She handles well and was well prepared and presented. A very attractive girl of good type, needing to put on a spurt of growth. Medium length even wedge, good width at the top, well set large ears. Straight profile, firm chin and level bite. Eyes of good shape and set and a good depth of blue. Medium length firm body, long legs with neat paws, proportionate length of tail. Points a darkish blue mingled with shades of cream which showed a little more warmth than desirable in places. Close coat of good texture; excellent temperament and presentation. .LAW’S FIORDILISO QTS CANBE(32b2) 28.10.09 Fine boned female who needs to make more growth. Good top of head with large ears which she held high on occasion. Good profile, pinch to muzzle, level bite and good chin. 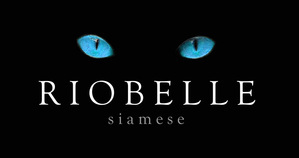 Oriental eye shape and set with clear, bright blue colour. Dainty type overall with slender legs and whip tail. Points all mingled and of good colour and a coat of good length and texture. Shown in good condition and beautifully presented. Perhaps being mated will pile on the pounds. A very correct and pleasing girl who is rather on the dainty side for her chronological age. Very good length to head with well proportioned ears with wide base. She needs to drop her ears slightly more which should happen with maturity. Even and vivid blue eye colour which are a trifle large and open in relation to her face. Even lines to the muzzle, her bite is level and she has a firm chin. Long, typical body with very good neck carriage, lengthy slender legs and with a long ,fine and tapering tail. Clear, sleek and well textured coat of a glacial white shade. Well mingled points showing shades of blue and creams. Delightful to judge and was well presented. She needs a rapid spurt of growth as she is nearing adulthood but she is otherwise lovely. stockings, good length of tapered tail to balance with just a slightly fleshy tip. her body does show the correct cold tone that points to blue tortie. 3rd – Law’s FIRODILISO QTS CANBE (32b2) 28/10/09. Litter sister to the winner but quite different in style. Dainty and of good type with medium length head that needs a little more width at the top, ears very large and flared but set a mite close and held rather upright today. Basically good shape and set to eyes albeit a little full, colour good. Almost straight profile, good chin and level bite, pronounced teething pinch at present. Dainty little body of good length, fine limbs and spoon paws, tail long and whippy. Unlike her sister her points are a soft pale blue, attractively mingled and with a pale cream blaze dividing the mask in two. Un-shaded soft fine baby coat. Extremely vocal and very friendly. Beautifully presented in a snug nest.